Welcome to the third sketchbook tour of my Summer Sketchbook Tour series! This one is all about foods as I used it as part of my 100 Day Challenge where I illustrate my favorite color snacks from around Dallas and beyond. This is the watercolor sketchbook I used and you can view in my sketchbook tour video below. Watch the video below to see the tour and read on for some tips on the benefit of going with a theme or a challenge for your sketchbook. 1. Prompts are already done for you. Of course with this challenge I had to pick out my own prompts, but typically when you join someone’s challenge they will already have provided prompts for you. It’s a great way to build consistency with your sketchbook because it removes the friction of you agonizing “what to paint next”. For my 100 Day challenge I have actually have a live list of things that i keep adding to as I experience them so that once I’m ready to start on my next sketch I just pick one from my list. Joining a challenge also provides some measurable goals that you can see your progress against. If you’re just starting out I would recommend picking a really easy and small challenge (like a 3 or 5 day challenge). That way you won’t be discouraged if you miss a day or if it takes you a little longer to complete. For my challenge, I am actually taking a brief break as I’m focusing on prepping for a few big events that Color Snack is a part of. We’ll dive into the beauty of themed sketchbooks later, but one cool side benefit of doing a challenge is that you will end up with a themed sketchbook that you can easily find and refer back to when you’re looking for something. You’ll notice my sketchbook is all food themed and I really like that about it. Don’t forget, you are the creator of this sketch world! so yes, you get to decide if you fill it up with one challenge or two or if your general theme is just different challenge prompts for each day. You also don’t have to fill up every single page. Sometimes I just sketch on one side of the page because my intention could be that I want to remove it and have it be a standalone art piece. For the purpose of this sketchbook and the 100 Day Challenge i’ve decided that it’s complete, but you may decide that you need to fill up all the pages. That freedom is your own absolute sketchbook glory. Enjoy it! and Practice it! 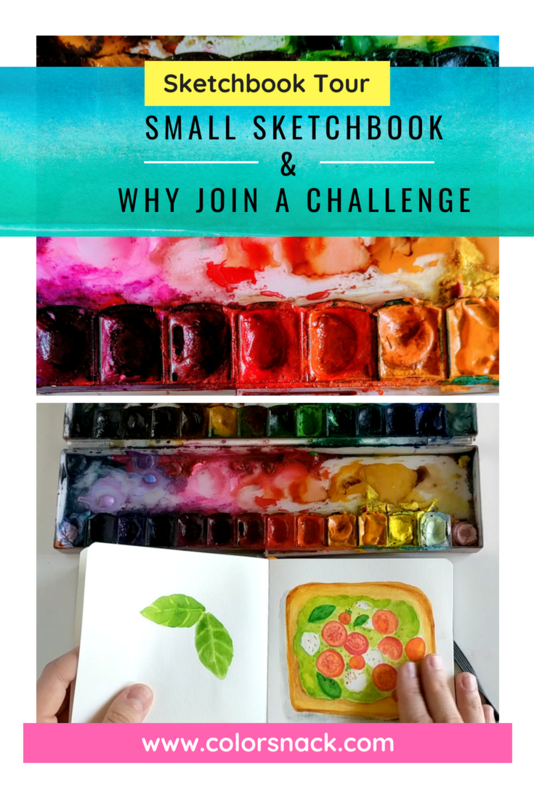 Let me know if you end up giving this sketchbook a try!